Fantasy Tattoos, Mythology, Mysticism and Sci-Fi...the stuff of our imagination. I bring these genres together here under "Fantasy Tattoos" because so much imagery is common to more than one of them (and sometimes all four). In some cases, this already broad classification can include images I've classified under the “Higher Calling” or “Walk on the Dark Side” groups as well. 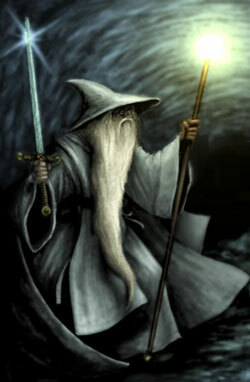 "A Wizard is Never Late..."
Yeah, Gandalf got most of the good lines in the "Lord of the Rings" trilogy...fool of a Took! So much imagery from our favorite stories, movies and television series. Think Chronicles of Narnia, Harry Potter, Snow White, The Princess Bride, Game of Thrones...just to name a few. Once upon a time (sorry, couldn't help myself) most people thought of "fantasy" as what they had grown up with in children's stories – with illustrated images of Faeries, Dragons, Elves, Sorcerers and Trolls. But now, as pop art and culture have taken fantasy into new "realms" of imagination with the latest online gaming and ever-improved CGI special effects, it seems that we can't get enough! And hey, why not role in some other stories while we're at it, right? Mythology can fit nicely into this niche...why not? 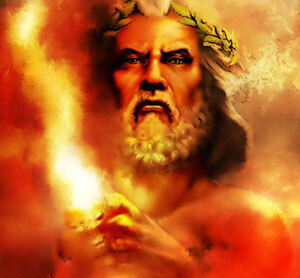 What is mythology if not ancient fantasy (from our perspective, anyway)? Mythical beasts, heroes and immortals from every corner of the world. Unicorns, griffins and gargoyles (to name a few)...all originally sprung from myth and folklore – and ubiquitous in the world of literary fantasy. These and so many others have found a massive following in our favorite contemporary stories and art. Speaking of heroes, I grew up with comics of Conan the Barbarian, while my nephew grew up with the TV series' Hercules and Xena. Thor has gone from mythology, to comics, to recent movies...so yeah, you can count LOTS of "superheroes" in this mix as well. Fantasy, whether based on Medieval or Renaissance superstitions, folk tales or the ancient mythology, has exploded in popularity in recent times – thanks to a huge wealth of fantasy fiction and what Hollywood has done with all of those wonderful stories. Pop culture...meet the worlds of Homer, Jules Verne, Robert Howard, Walt Disney and Steven Spielberg (oh...and don't forget Stan Lee!). Are Fantasy Tattoos for YOU? Well, if you LOVE this genre and think you will still love it 20 or 30 years from now, why not? And this is one of those categories with seemingly endless design possibilities and combinations.